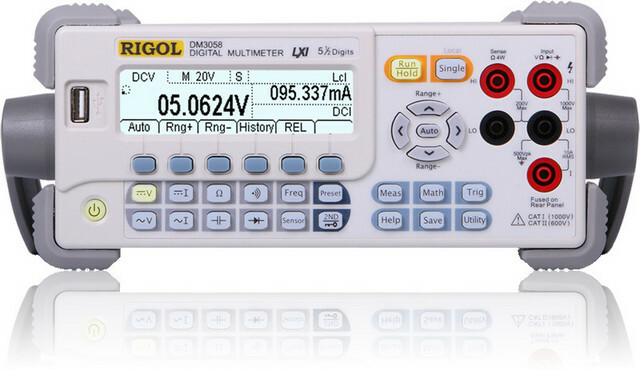 The Rigol DM3058 is a high quality digital tabletop multimeter of the DM3050 series with a sampling rate of max. 120 Sa/s. These Rigol multimeters have a very sophisticated and easy to use interface and provides plenty functions for all measurement tasks. The use of the menu navigation is very intuitional and the device will provide precise results in its many application areas. With the help of a computer you can perform long running monitoring tasks too. The LC-Display is with its 256x64 pixels easy to read and provides a very good overview over all features. The display has a resolution of 5½ digits (max. count 240.000). With the build in USB Host-Port you can save test readings and settings on an USB-Stick. Settings can also be saved in 10 internal storage locations. This model has a maximum count of 240.000. Every function and every Button has a short description in the build in online help feature. Simply press and hold a button to see its description. The DM3000 converts the sensor physical properties into electrical voltage, resistance, current for measurement and shows measured and corresponding values. As the only device of this class the Rigol DM3058 has a build in Web Interface. It is possible to control all of its features and settings remotely with this Web-Interface. A very easy configuration of the network settings (using DHCP Server or fixed IP setting) makes this device available in any network very fast. The Web-Interface provides an easy way to all settings and the remote control of the device. In the Web Control mode the frontend of the device is visible in the browser. The functions can beeasily accessed using the mouse and clicking on the displayed buttons. All measurement values are shown on the virtual display.